I have been told by my doctor to fitten up. So I have bitten the bullet and gone the way of the dieting and the no smoking and the less drinking and the sleeping more, and the exercising..blah, blah blah. I also had most of a pita with deli chicken, and am currently trying to force down a cup of peaches. (I know I know everyone loves peaches. Well I hate fruit and vegetables so how fucked up is that shizzle?). 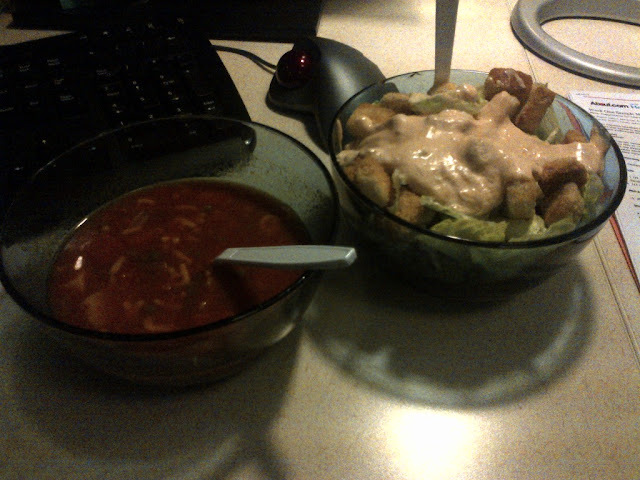 Total calorie count: ±1330 cal. Friday Lunch, you ask? why feast your eyes!! In other expectations, I plan on taking a couple hours and arting up tonight. So that you may have a nice little comic to read, should you be stuck indoors this weekend.